Half of the households in the Brazilian State of Bahia have uninmproved sanitation, as shown by an analysis made by CORREIO in statistics from the National Geographical and Statistical Institute (IBGE). In the municipality of Pilão Arcado, with a population of about 35,000, half of the households do not even have a bathroom. You go to the bathroom, you do what you have to do, you flush and where do you think all that goes to? Alright, you don’t have to exercise your imagination regularly. And maybe you are better off that way, because in half of the state of Bahia all that goes to several places but to where it should go. And for about one million people in Bahia this exercise of imagination does not even make sense. That’s because they don’t even have a bathroom. In Bahia, only one in every four municipalities (103 out of 417) has an installed sewage system. And, even if they have a bathroom, half of the homes of the state have been discharging sewage improperly – directly into black holes, ditches or into rivers, lakes or the sea. The data was extracted from the National Geographical and Statistical Institute (IBGE) and the National System on Sanitation Information (SNIS). In the municipality of Pilão Arcado, in the North of the state, with a population of 35,000 people, half of the households have no bathroom, according to the IBGE data. So what do they do? “We go behind the bush. We cannot build a nice home, a bathroom. Everything here is underdeveloped”, says 51 years old Nilza, , who lives with her husband, two children and a granddaughter in a little mud house in the settlement of Pedrinhas, in Pilão Arcado. Having always lived off crops and fishing, she has never had a bathroom at home. “I’ve only used it at somebody else’s home”. Out of the approximately 15 mud houses of the settlement, “only about four” have bathrooms, according to Josilene Alves de Souza, 27, who doesn’t live in any of them. “Many times, at night, I have a stomachache and we have to rush to the bush”, she says. She lives with her husband and three children – 4 months, 2 and 3 years old where?. Herand her husband count on the government social aidprogramme – Bolsa Família – and on their own crops to survive. While she was speaking to CORREIO her baby was crying in her arms. “He’s got dysentery and fever”, she said, noting that otherchildren in the area have diarrhea very often. “It’s the heat”, she assumes and then adds: “It must be the wind as well”. Environmental engineer Jorge Glauco Costa, professor at University of the State of Bahia, explains that the lack of investment in a sewage system ends up weighing on the health system. “There is a huge overload on the public health system (SUS) because of the lack of a sewage system: worms, hepatitis, cholera, diarrhea and dengue even”, he explains. “The population ends up demanding more from the health system, they lose more days of work and thus economy suffers”, he explains. The city government acknowledges the problem. “That half (of houses without bathrooms) belongs to people who live in rural areas, in settlements”, explains the Mayor’s Head of Staff, Wagner Santana. “Some of these people have been enrolled into a bathroom construction program. In the city area there were many houses without bathrooms and they got one built. Two hundred bathrooms were built last year”, he concluded. As the city of Pilão Arcado is waiting for the sewer system to be finished by the end of the year, in addition to the almost 50%% of the homes without bathrooms, in 42.38% of the houses, sewage is flushed to a rudimentary hole – the so called black holes, without any treatment. This is is considered proper by the United Nations, which only considers sewage to be properly disposed through sewer systems or septic tanks – in which sewage is isolated and neutralized by microorganisms before it is sent to a drain. DOM BASÍLIO – However Pilão Arcado is definitely not alone. The municipality of Dom Basílio, located in the center-south of Bahia, is the state record holder of bad sanitation: about 0.5% of households in Dom Basílio are connected to a proper system (see complete map on the side). Just like in Pilão Arcado, the municipality is not provided with a sewage system. In total, 80% of houses use black holes and 16.7% are not provided with bathrooms, according to IBGE. In comparison, in the state’s capital, Salvador, only 0.42% of the households have no bathroom. And the capital city has 93.12% of proper sanitation – 90.8% of sewage system coverage. When consulted, the coordinator of the Water and Sewage Autonomous System of Dom Basílio (SAAE), José Bonfim, recognized that the situation needs attention. “The SAAE does not have such a large budget. We are doing everything we can in this administration. We will hire an engineer and I think that by the end of the year we will have a project in our hands”, he predicts. 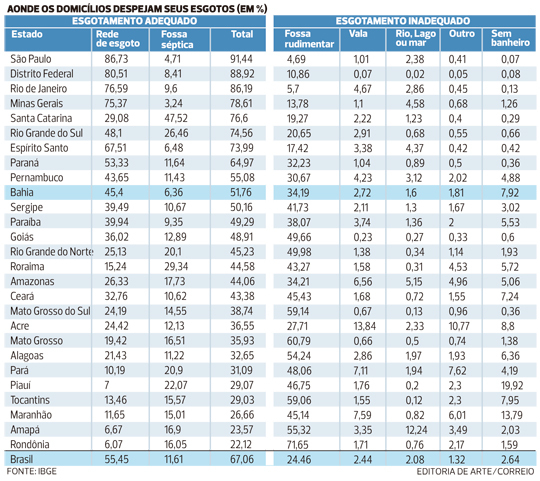 NATIONAL RANKING – In spite of the negative numbers, the 51.6% of households that have proper sanitation place Bahia in the 10th position in the national ranking. “Brazil’s Regions North and Northeast follow Bahia’s pattern”, said Prof. Jorge Glauco. “When the system is in place, it is not efficient,” he added, noting that in São Paulo things are better than in Bahia, but still far from ideal. “In Brazil, investment in ‘buried construction works’, those that nobody can see, is very low” he said “In the North and Northeast it is the most precarious as it gets; in Brazil it’s only ‘precarious’”, said Prof. Glauco. When asked about the sewer system problems in the inland, the Secretariat of Urban Development of Bahia (Sedur) responded through a note that this situation is mainly due to the lack of financial resources invested in the expansion of the infrastructure before 2002. The note also states that the responsible of the sanitations policies belong to the municipalities, and local governments must decide whom they will grant the service. Embasa (The State Water and Sanitation Company) is active in 81 municipalities of the state. The note adds that Embasa provides water supply and domestic sewage collection services, but the property owner is responsible for the sewage collection inside homes, including piping, flushes, toilets, and sinks.